I have no excuse for not posting other than being busy-busy and going back and forth to Oklahoma and Texas alot. I have been doing a lot of crocheting and knitting though. I made 4 felted purses, 1 cable knit purse, 1 set of hunter-orange knit hand warmers (for my tom-boy niece), and a 1 scarf made of a yummy cotton-cashmere blend (hopefully picture to follow). 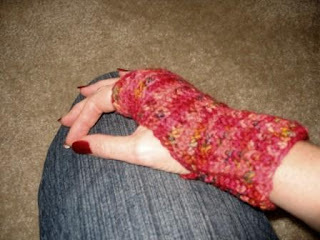 I also made myself some cool hand warmers from the CrochetMe Wristlet pattern with a DK weight of Koigu. 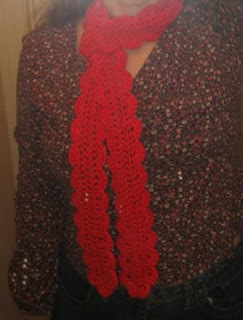 I didn't even know they MADE a DK weight, sooooo I HAD to buy some and here's what I made with one of the skeins. 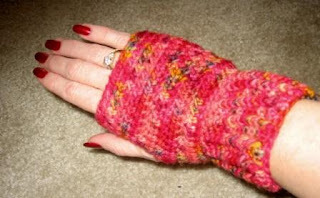 I did adjust the pattern to Normal Wristies even though I am a Wee Wristie in real life and used HDC instead of SC on the Thumb-bit and Top O' the Mitt because the Koigu in DK is a merino and a lot like cotton so it didn't have really any stretch. There is also a new class at Yarntopia that I am teaching as well. It is Stitchmania. 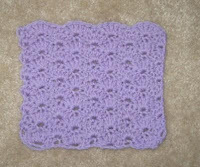 Each month we will learn 2 new crochet stitches. At the end of the year, we'll have enough blocks for a throw. Here is a block in the Shell stitch. I am presently fiddling with how I want the blocks to be joined and bordered. I don't want to sew them together (how 70's!!) but also want it to have a modern feel. I'll post my results. We have had a great Christmas season with one exception. My DS Asa blew out his knee just before Christmas. He tore his ACL and MCLs and is having surgery on the 19th of this month. This pretty much rules out his getting to play soccer in his Senior year. He's really bummed about it. This is the same leg he broke his growth plate and broke his shin his Sophomore year. Please keep him in your prayers for a speedy recovery and physical therapy. It would be great if he could at least step on the field for their last game in May.